As part of a business analysis, a business case outlines an opportunity and a recommendation to invest resources to take advantage of it. Think of the business case as your marketing or sales brochure for your idea. It may be your one shot to get approval for a project that may have a significant strategic, structural, or political corporate impact. A compelling case requires enough facts about the recommendation to make it credible and the correct positioning for the audience or reader to buy into it. To provide insight into the viability of your solution or idea: At minimum, writing the executive summary and mission statement can give you incredible insight into the viability of a solution you’re considering. It also helps you organize and collect your thoughts and validate what may just be a gut feeling that this solution is correct. The writing process also provides a foundation for further analysis and solution development. To support a feasibility study: A feasibility study is an analysis effort to determine whether the opportunity can be reasonably achieved. Presenting a strong business case can garner you support for conducting this study. To prioritize projects: Sometimes you need to conduct one or more projects to achieve the final solution, and the business case helps you prioritize them. For these types of projects, the business case can explain for project team members the overriding strategic goal and mission of the project so that the subprojects have a context. Even if a business case is approved, it may be cancelled or changed after further analysis is conducted, so you may need to develop a follow-up business case. Knowledge level about the opportunity: If members are familiar with the issue and context, you don’t have to go into great detail in your case. If they have no education, background, or framework for the subject, though, you need to provide significantly more details in the business case. Say you’re trying to make a case to a company regarding launching a new accounting software program for individuals. If the audience doesn’t know anything about launching programs on the individual level, you can compare this process to something members already know, such as when they went from only developing programs for large companies to developing them for small companies as well. Reminding them that they’ve changed markets before in a similar way can help them be open to learning about the new market. Decision-making authority: Know whether the first reader is the final decision-maker or whether the case needs multiple levels of approval or a committee’s approval. Your understanding of all the stakeholders participating in the approval process is critical in making it relevant for each of them. If you’re making one presentation to individuals with different information needs, you should focus on meeting the needs of the ultimate decision-maker. If your case will go through multiple reviews and approvals, tailor the case’s executive summary for each individual. Passion for the product or problem: Knowing your audience’s level of passion for the case is critical. If you know audience members are passionate about the contents of the case, don’t spend much time trying to get them excited; they’re already there. If the audience perceives your case as just one more project to review and sign off on, then you’ve got an uphill battle. Add information to your case that gets audience members excited. Find something to relate the project to that they have passion about. Desire for details: Some people are i-dotters and t-crossers; they closely read everything they’re given. Others prefer to skim through written messages or skip everything but the pictures. Knowing which category your audience members fall into is vital so that you can provide the right level of detail for your audience. If you haven’t worked with your audience before, ask around. You can most likely find other people in the organization who’ve presented to your audience. Find those people and get guidance on how to proceed. You must write your business case while keeping all audiences in mind by including points that address all audience members’ needs. Achieving this goal may mean you have to have two different summaries, depending on the audience reading the business case. Defining and presenting the opportunity: Here’s where you clearly make your case with a persuasive outline of the recommendation, a statement of key points, and the bottom line conclusion. Justifying the recommendation: Provide the top-level evidence that assures the audience that your recommendation is the right course of action. Give an overview of your evaluation criteria and the results that support your conclusion. Most notably, compare and contrast the options considered and clearly position the recommendation as the winner. 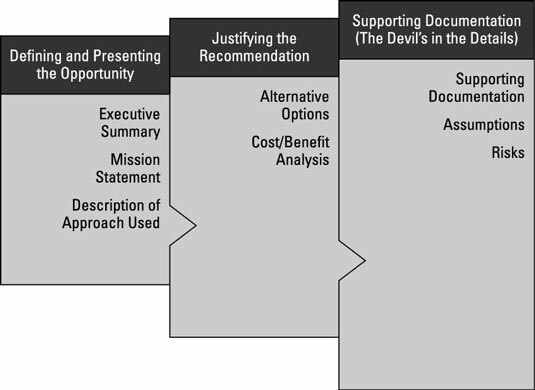 Supporting the documentation: The supporting documentation allows your detail-appreciating audience members to see the evidence with their own eyes and confirm the validity of your analysis, assumptions, and conclusions. Each category features sections that provide increasing levels of supporting details.